Have a continuous form? Difficulty finding great pricing or someone who can do the job? Look no further! We can print 1 to 6 part continuous forms with quantities ranging from as few as 500 up to 500,000. 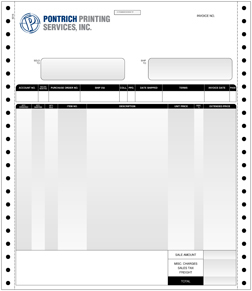 We can produce all of your “ODD SIZE” forms, including: 3", 4", 6", 8", 12", 16", and 17" lengths!